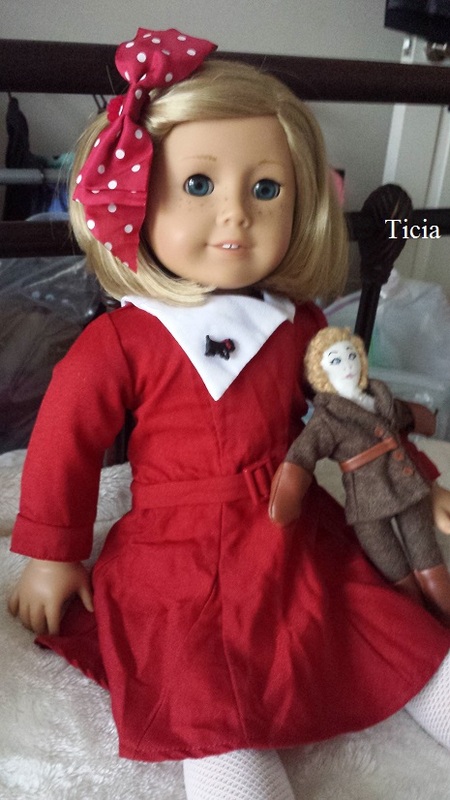 Here is Kit's dress for Christmas which is now different from the original one worn in the 1st run of AG Kit books. This is a Beforever dress. Book still references older dress. Her current dress has a thick fabric that is nice sturdy quality. Stitching is beautiful and all the pleats are darling, perfect for this dress. Velcro in the back and on shoes. The shoes are very hard to get on without snagging stockings. I prefer that AG keep stockings and get rid of velcro on shoes if I had to choose one over the other. Dress fits nicely on Kit. 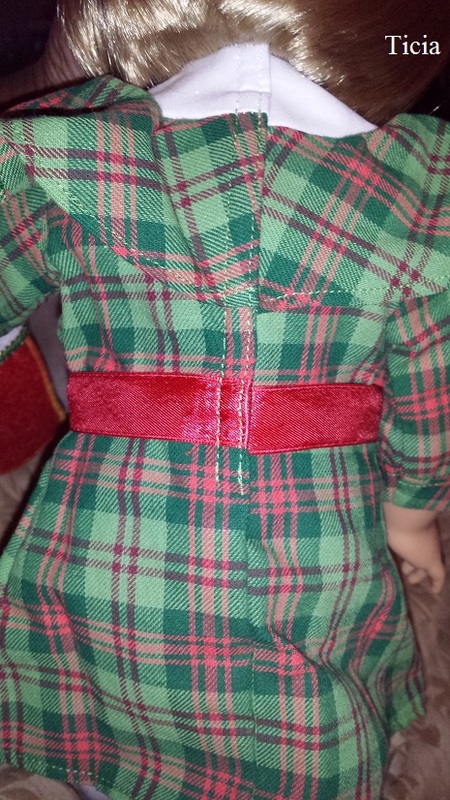 Not too snug and my Kit doll is pretty wide in the waste and torso. Stockings are not like long socks like the original outfit they are actual stockings! Similar to Samantha's stockings in her collection if you are counting or interested in more of these items like I am. 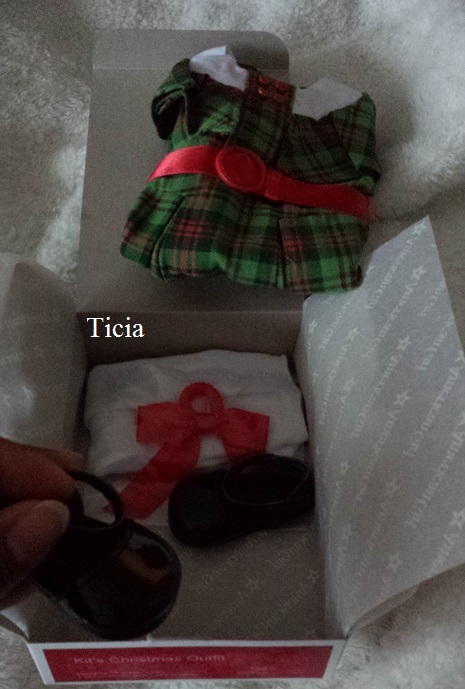 Bow is cute, very pretty and made of nice material not flimsy like the polka dot bow prior to this outfit. Monkey is a smaller version of a sock monkey fabric and all the same as a real one that you'll see in toy stores now. Very nice quality and the bow is a nice touch. 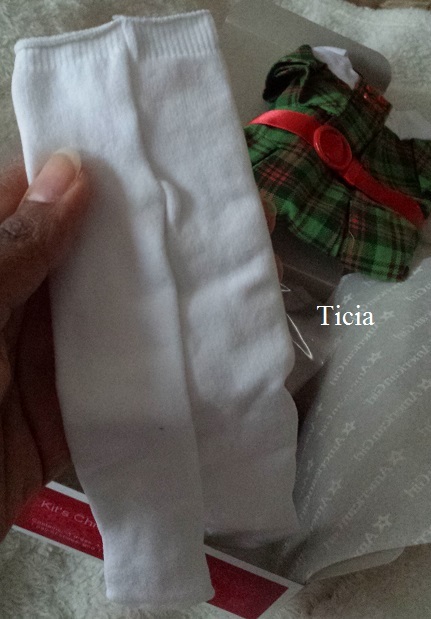 The stocking is so well stitched together and the design is a nice wink to the 1930s. I have seen this design in older store catalogs from the 1930s. If you watch old movies it is something you would see in Miracle on 34th Street. I love this outfit and it is so well made. Every thing about it is gorgeous even the circular plastic belt buckle refuses to look cheap next to all of the beautiful features this outfit offers. 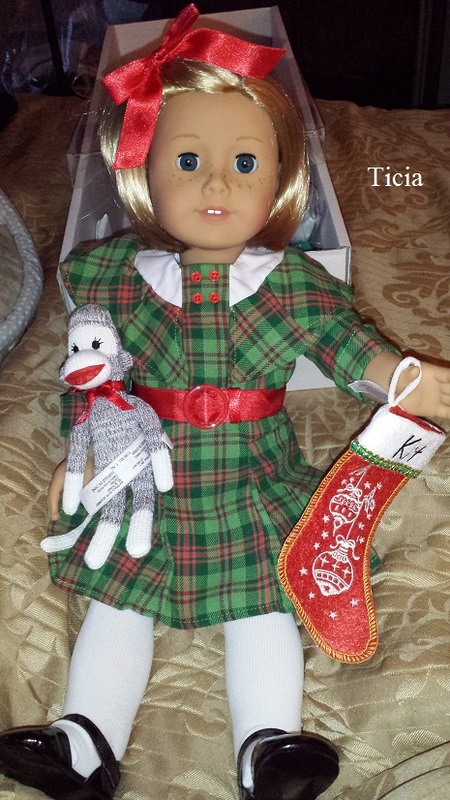 Outfit and stocking is by far my favorite Beforever items thus far in Kit's collection. Hope they keep it up 2018! Red dress wrinkles easily and new Christmas dress does not. Both dresses are iconic Kit! Collectors and parents might want to buy extra velcro from craft store to help with possible snagging. 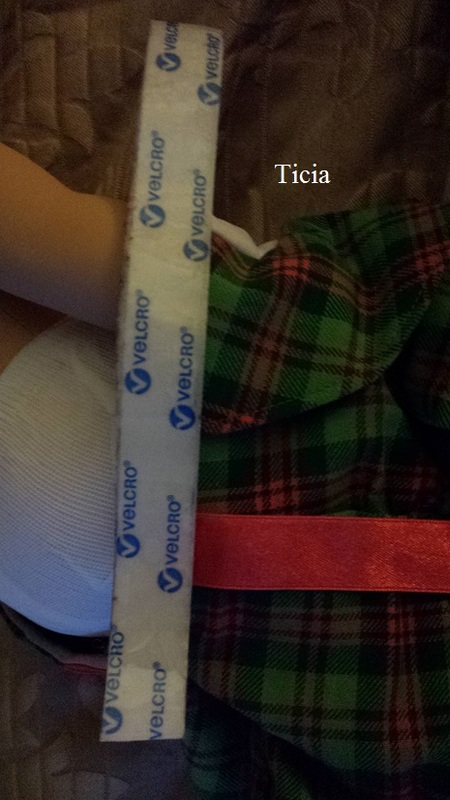 Place a strip of velcro over dress velcro to prevent any runs in stockings. You want this outfit to last for years to come. It is beautiful and worth it! Thank you Ticia. Beautiful dress! Love the "extra velcro" idea!